THE IOWA BUILDING - The lakeward end of this structure was the regular "Shelter" when Jackson Park was a green and beautiful mall. Here the young people danced on Saturday nights, and little children romped on rainy days. 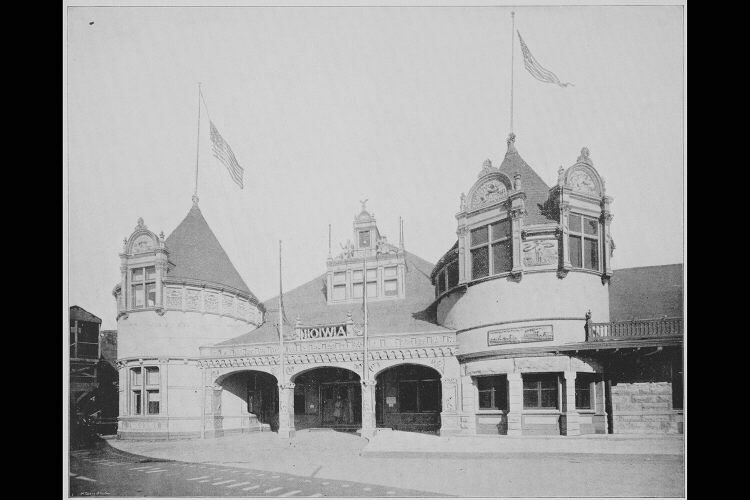 Iowa was second on the list of applications for space in the park, and was first assigned a tract on the site of the little round restaurant which still stands near the Victoria House. Afterward, however, the site was changed, and Iowa was given the only State tract on the lake shore. As the Park Commissioners would not allow the enthusiastic Hawkeyes to pull down the costly "Shelter" their architects, Joselyn & Taylor, of Sioux City, set about the difficult problem of enlarging the low and rambling rustic pavilion. Mr. Joselyn was of an ancient French family. One day while he was looking over some family relics of the Chateau de Joselyn, a historic structure still standing in his native country, he found it possible by an enlargement to the "Shelter" to reproduce the chateau of his ancestors, and he obtained the consent of the park Commissioners (the legal authorities usually in control of the grounds) to make the additions. The area of the Iowa Building thus became two hundred and twenty-three by sixty feet, with a two-story west end, though preserving the appearance of the one-story Shelter. The interior decorations of this great area were one of the principal sights of the Fair, and were composed of cereals, with a "coal palace" and other features. Cost, $35,000.